Congressman Gary Peters and LTU alumnus and trustee Larry Lawson, executive vice president of Lockheed Martin and president of Lockheed Martin Aeronautics, stressed the importance of industry partnerships with universities when they joined a Jan. 31 breakfast meeting at the Center for Innovative Materials Research at Lawrence Technological University. It was Peters’ first visit to campus since his congressional district was redrawn to include LTU, although he has been supportive of LTU programs both as a state senator and then congressman from Oakland County. Peters spoke of the need to remind people in Washington, D.C. and elsewhere that Michigan has the highest concentration of engineering talent in the country, along with some of the most advanced manufacturing systems. Lawson said industry wants the nation’s higher education system to educate more engineers needed to fill the specialized jobs required for advanced manufacturing systems. He said the country needs to encourage children to pursue their interest in math and science and then later in technology and engineering – known as the STEM subjects. He announced that a partnership with LTU is under development to use robotics to promote early education in STEM subjects. Michigan companies can help the cause by partnering with universities like LTU to give college students exposure to jobs in engineering and technology, according to Mark Brucki, the executive director of economic development and government relations at Lawrence Tech. 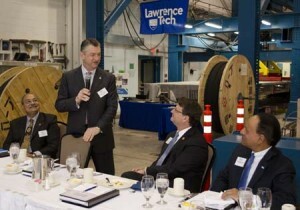 The Michigan Economic Development Corp. was represented by Doug Smith, senior vice president for business and community development, who said he will be working with Lockheed Martin and LTU to develop strong supplier relationships through the Pure Michigan Business Connect program. Several Lockheed Martin suppliers in Michigan were also represented at the meeting. The meeting was attended by two LTU alumni now in leadership positions at the U.S. Army’s TARDEC research complex in Warren: Jennifer Hitchcock, executive director of Research & Technology Integration; and Chief of Robotics Jim Overholt. Two other LTU alums, Mohammed Mokhberi and Javad Mokhbery (brothers who spell their last name differently), came from California to attend the meeting. Their company, FUTEK Advanced Sensor Technology Inc., supplied two sensors that are on Curiosity, the NASA Mars rover.